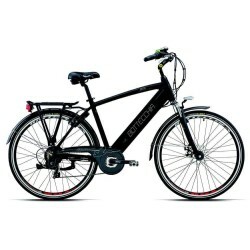 Go wherever you want with this city bike eC01 D10 versatile and equipped with the latest engine Bosch Active Line 2018, in order to always arrive on time at the office. Equipped with the latest top of the range accessories, this electric bike allows you to enjoy maximum comfort in all circumstances. Start in a flash with its automatic transmission and go faster and further during all your walks. Autonomy : 400Wh offering up to 160Km of autonomy.